Instant credit card approval for those who live in the fast lane. Instant credit card approval is now at hand. Standard Bank has introduced a site which gives consumers direct approval for Blue Bean credit cards. A further plus is that it won’t cost you a blue bean, as there are no monthly fees. That is, provided you spend a minimum of R2 000 a month when buying with the Blue Bean Credit Card. Blue Bean offers two payment options – the Automatic Bill Payments (ABP) and the Automatic Payment Option (APO). The APO gives consumers the flexibility of choice. They can select their payment amounts and the date of repayment from their bank accounts. The ABP options allow you to pay accounts such as cell phones and avoiding the irritation of queueing at a bank. The cards, designed for people with busy lifestyles, has a contactless payment system, easy and safe to use for purchases under R200. Self-service banking is available, allowing consumers to control their finances wherever they are using the internet, cell phone or telephone banking. 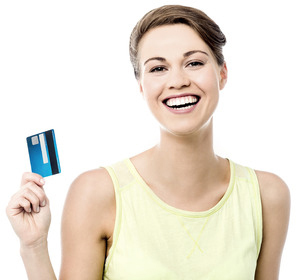 You can personalise your card for an extra fee. Tap and Go. These cards have an embedded antenna. Just tap when making purchases for less than R200. This “contactless” form of payment improves card security as consumers do not have to swipe, hand over the card to a cashier, or enter their PIN numbers. Features. With a Blue Bean credit card, you can use any ATM – locally or internationally – to view statements, withdraw cash, make deposits, pay accounts or ask for balances. It also offers FREE self-service banking such as the internet, cell phone and phone banking. Save Money. Blue Bean credit card holders can save on ATM fees by using Standard Bank terminals. Budget Facility. Card holders can buy items and spread their repayments over six months to five years. Internet Shopping. Blue Bean offers secure internet shopping with features such as unique PIN numbers for each transaction, shopping payment guarantees and blocking outside access to personal credit card details. 3D Secure. This feature protects consumers and merchants by verifying personal data before a transaction. It ensures an extra level of protection with OTP. What is OTP?. Card holders are given a unique OTP via SMS for every transaction instead of using their username and password. FREE Electronic Statements. Instead of relying on the postal service, consumers can have their statements sent directly to their email address.